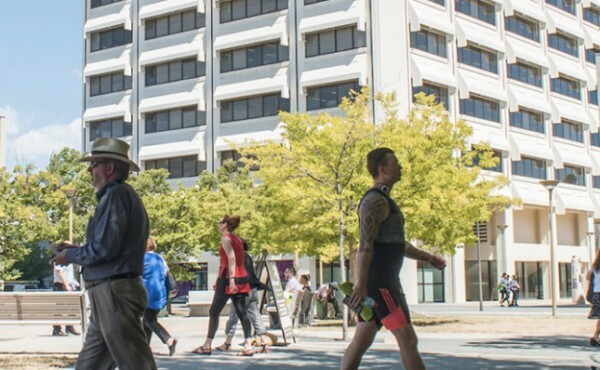 The ACT Government’s Draft Variation to the Territory Plan risks turning Woden into a concrete jungle bereft of community facilities and services, according to a submission from Woden Valley Community Council. The WVCC has called on the Government to reconsider the DV and establish a multi-disciplinary team to conduct an integrated transport and planning review of the Town Centre and corridor from the City to Mawson. The WVCC’s submission says the DV is a plan for developers and not the community, focusing on high-rise buildings and neglecting the need for more community facilities. It says many features found in planning strategies for other ACT Town Centres areas are absent from the Woden DV. “The Gungahlin Precinct Code contains many features that are not included in the Draft Variation for Woden. There should be some consistency and equity between the Town Centres and the draft Variation for Woden should be updated to include, for example, an entertainment precinct, a community and recreation facilities precinct, sites for surface public car parking, a cycle network and public transport stops,’’ it says. The submission says sites for community use should be identified so they were not built out and include an entertainment precinct; higher education (a CIT close to the Town Centre); a community centre; a pool; and a multi-purpose sports facility. The submission also wants building heights to be stated in metres, the retention of the current buildings on the Town Square perimeter to maintain sunlight levels in the cooler months; retention of solar access along the east-west spine; and the identification of green, open spaces, including retention of Arabanoo Park as open space. It also calls for an analysis of ways to capitalise on Woden’s economic advantage of hosting the Canberra Hospital, including health education facilities and a health ‘hub’. The submission says education and community facility proposals contained in previous Budgets have not materialised. The submission also states that the projected population declines are a cause for concern. The WVCC says the Government appears to be expecting the private sector to provide community facilities and open spaces but these are likely to be only in their own developments. “The private sector is not likely to provide community facilities for the broader population, including the CIT, community centre, multi-purpose sports hall or a decent pool,’’ it says. The submission says DV is of critical importance to the Woden, Weston and Molonglo communities. “However implementation in its current form will see the construction of high-rise buildings from 16 to 28 storeys, with little regard to the community’s needs, including solar access to the Town Square and green open spaces. Woden may become less liveable – a concrete jungle of high-rise residential towers,’’ the submission says. Do you think Woden is in danger of being swamped with high-rise buildings? Does the DV neglect the needs of the community? What would you like to see happen in Woden? The Canberra Times front page picture today shows several boys dangling their legs which isn’t exactly “dangling”. Where’s a water cannon when you need it? If people could see how good these type of developments work overseas where people comfortably live right above the shops creating a safe and dynamic hub we might not have to hear facile old outdated sayings such as, “concrete jungle”. It is a meaningless term and does not take account of all the many people who would like to live right near the library, bus stops, shops, PO, health, gym etc. Woden is a disgrace currently, so bring back the people and the life. We need more suitable choice for people who want and need to downsize without having to go into all the units that are going up just that little bit too far from the shops for comfortable walking in the rain/ heat/ cold/ frost – those places are fine for young owners and renters. We could free up some of the local Woden big houses if there was somewhere for the older people to choose, but they need to be right ‘on’ the shops etc – like they do in many places overseas that are dynamic and beautifully designed with diversity and interest. We need a variety of choices, there is an untapped market. Woden town centre is already a concrete jungle. Possibly one of the most miserable parts of Canberra, no thanks at all to the sprawling planning disaster that is Westfield Woden. Woden is a place to go if you have to buy something but definitely not a place to go and live in.